Tonight I made some basic lentil soup but it turned out really flavorful. I served it with Roasted Curried Cauliflower. Delicious and easy meatless dinner idea. Heat olive oil in a large pot over medium heat. Add onion, carrots, and celery. Saute until the vegetables are tender. Add garlic, salt, and pepper and saute for a few more minutes. Add the tomatoes with their juices, mashing the chunks with your hand. Simmer until the juices evaporate a little and the tomatoes break down, stirring occasionally, about 8 minutes. Add the lentils and mix to coat. Add the broth and stir. Add the thyme sprigs. Bring to a boil over high heat. Cover and simmer over low heat until the lentils are tender, about 40 minutes. 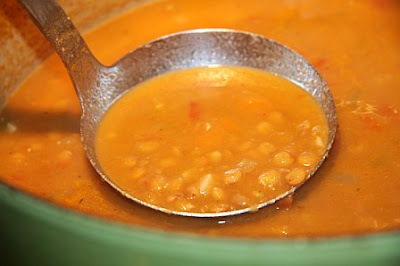 Transfer 4 cups of soup (mostly tomatoes, veggies, and lentils plus a little broth) to a blender and blend until smooth. Pour back into pot and stir to combine. Ladle the soup into bowls. Sprinkle with parmesan and serve.